Tourism Minister, the Hon. 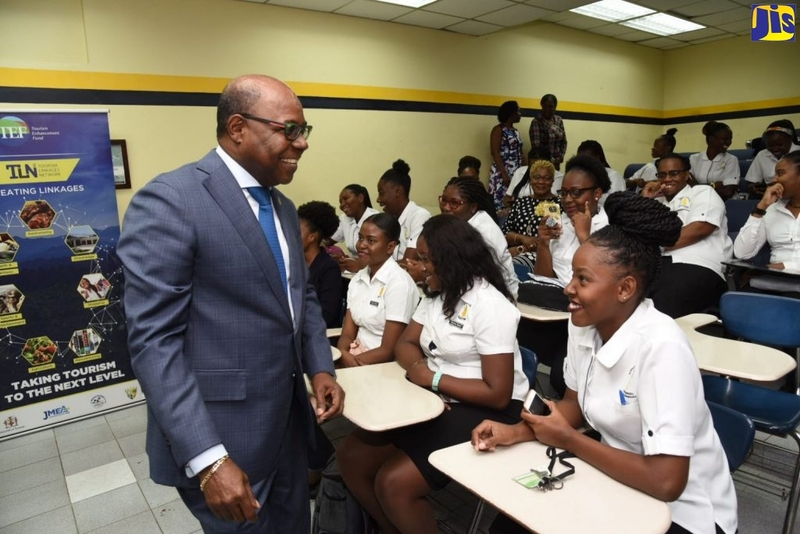 Edmund Bartlett has revealed that a full scale Police investigation is now underway to identify the person or persons who have been swindling job seekers of money, on the basis that they will secure jobs in local and overseas hotels. Speaking at a press conference in Kingston on Thursday February 10, Minister Bartlett said the matter has been reported to the Police and that anyone found guilty of this practice will be made to feel the full force of the law. Minister Bartlett explained that he was informed about the scam following his return from Spain where he had discussions with current Spanish investors to explore the prospects of expansion. He said “it has been brought to my knowledge that there are individuals or an individual who is constantly calling around to some hotels, to some institutions and organizations in the country purporting to be from the Ministry of Tourism and even suggesting to be the Minister of Tourism, soliciting support and or attempting to recruit people for overseas and other hotel work experiences." He added that “we want to categorically say that the Ministry of Tourism does not involve itself in the recruitment of workers for local or foreign tourism hotel programmes. Certainly for sure, the Minister has not, nor have we given permission to anyone to operate in such a manner on our behalf and I want to warn that this is a criminal act and that every effort will be made to find out who these perpetrators are and they will be brought speedily to justice." Minister Bartlett is expressing confidence in the ability of the Police to identify and locate the person or persons involved in this practice. “I feel confident that the person involved in this scam will be caught. Only a few months ago someone who swindled others of money in exchange for jobs in hotels was caught and is now serving time in prison”, he said. The Minister is also expressing alarm that the tourism sector has been targeted in this manner. “I cannot understand the reason behind tourism being targeted for this kind of treatment. However, I am issuing a word of warning for those involved to stop immediately,” Minister Bartlett expressed.